Inshore: Snook fishing continues to improve with warming weather. The snook are more active by the day and really beginning to push towards the inlet. 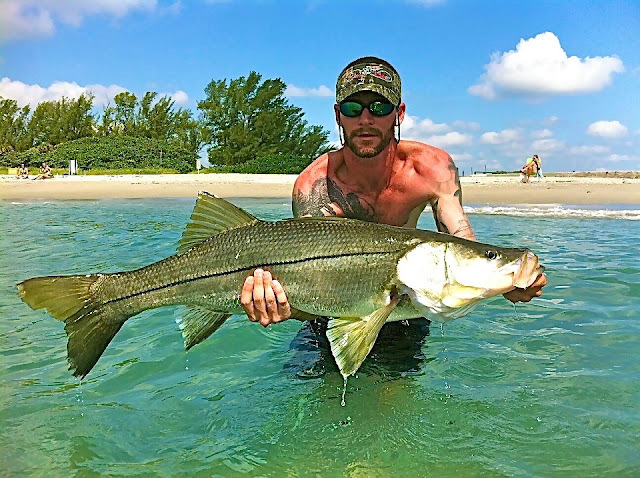 Best snook action will be at night around bridges closer to the inlets, with outgoing tide being the best. Bigger swim baits, flair hawk jigs, and swimming plugs are all good choices for the snook. Live mullet are also great bait choice for the snook. Mangrove snapper are starting to filter into their normal inshore summertime hangouts. Mostly smaller mangroves right now, but some better ones should be close behind. Sandperch are biting very good inshore right now, with small pieces of fresh shrimp being the top bait choice. Surf/Pier: Pompano action has started to slow, but is not totally done yet. Early morning and late afternoon are the best times to target pompano right now. Sandfleas and clams remain the top bait choice for the pompano. Snook are starting to move along the beach in better numbers, have been around the Juno Beach Pier, and are filling into the inlets as well. Live croakers and sardines will be the top snook baits. The Juno Beach Pier has had good action this week with scattered Spanish and King Mackerel, big jacks, and snook all hanging around. The live baits are showing back up around the pier in better numbers...and the bigger stuff is not far behind. Lots of good stuff going on!